M.E.C. maintains a complete inventory of aluminum flanges and waveguide extrusion from 1 to 40 GHz in Double-Ridge and in MEC FLATGUIDE ®. 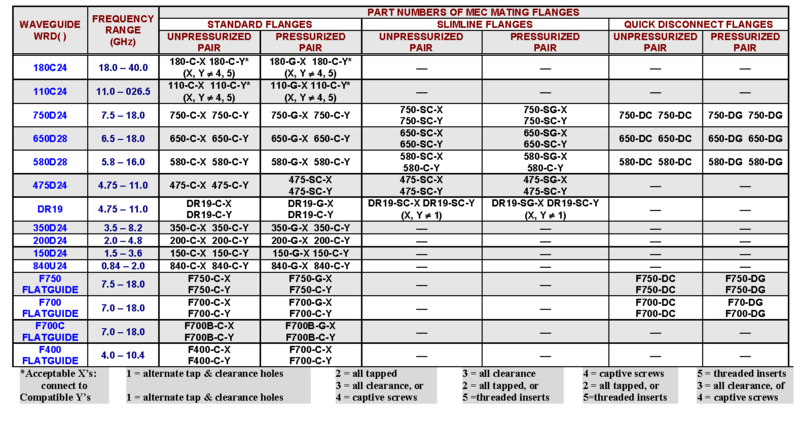 Available flanges include all combinations of cover or gasket faces with tapped, clearance, alternate or captive holes. 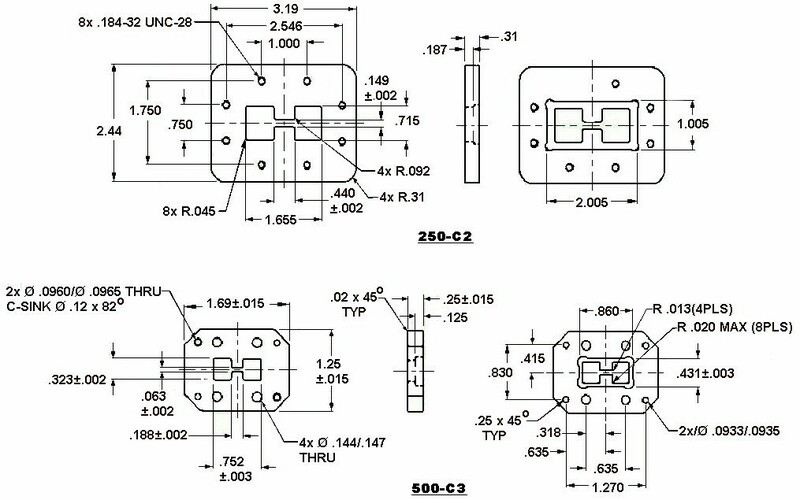 These flanges, which had long been the industry standard, are incorporated in MIL-F-39000/3B for Double-Ridge and MIL-F-3922/75B for MEC FLATGUIDE®. Additionally, M.E.C. 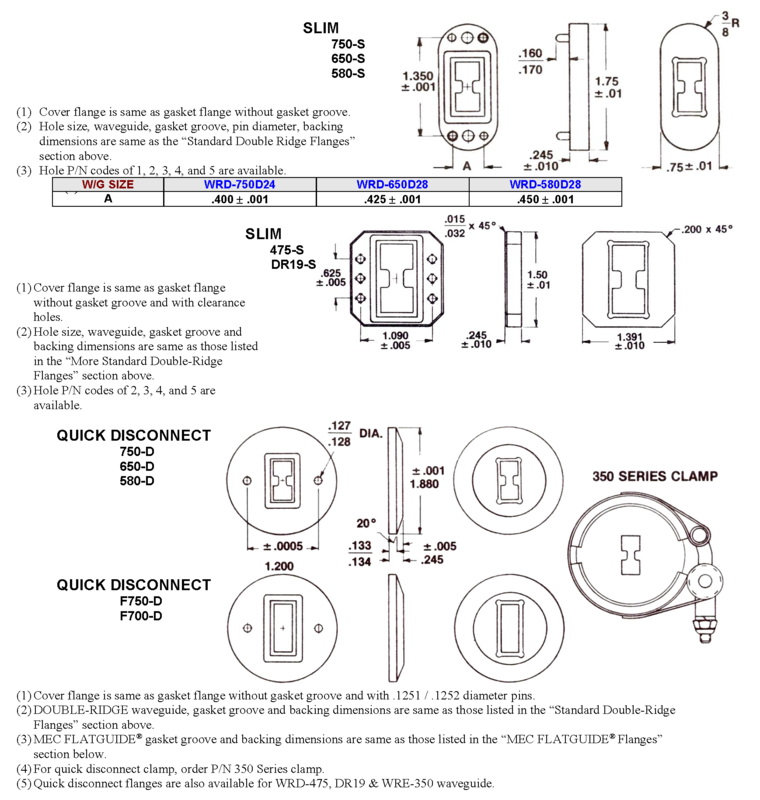 has developed many special-purpose flanges such as metrics, quick-disconnects, and slim line styles for tight quarters. 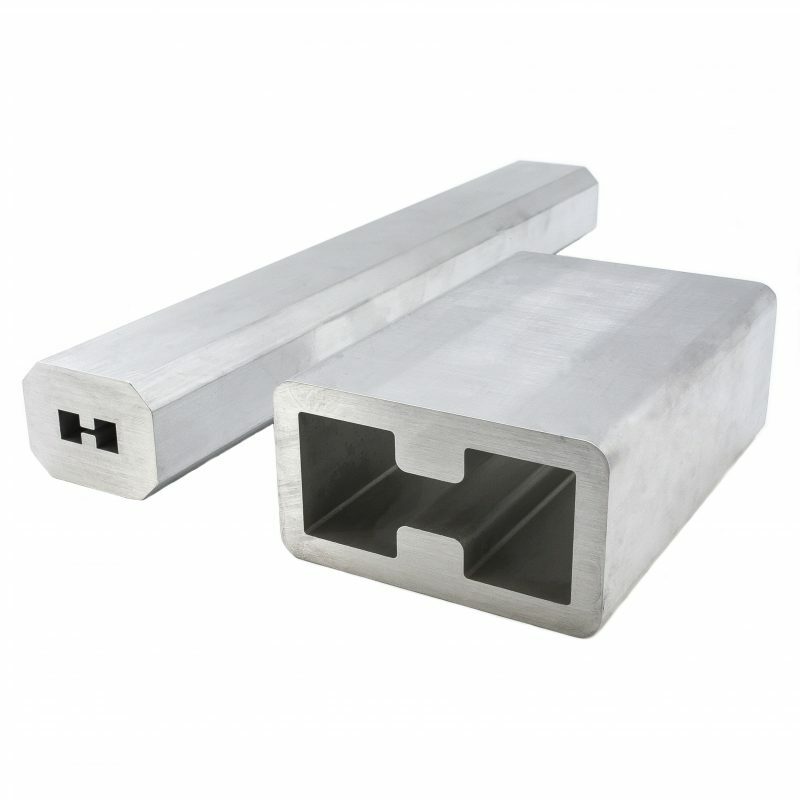 Also available are waveguide extrusions such as those listed in MIL-W-23351/4B for Double-Ridge and MIL-W-85/4C for MEC FLATGUIDE®, as well as flexible waveguide and other sizes custom-designed by M.E.C. 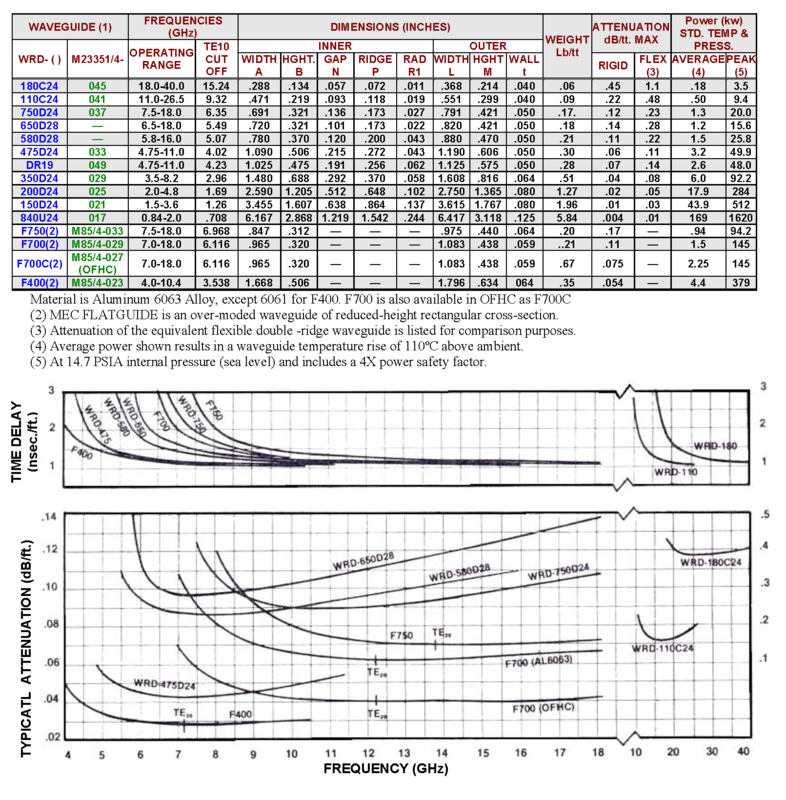 for specific frequency bands and characteristics. 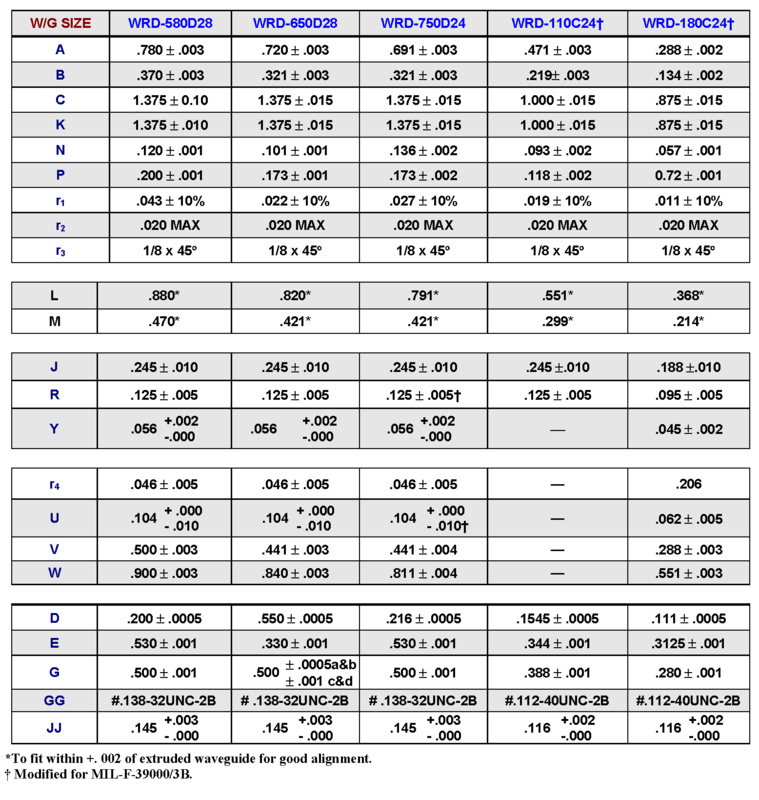 The following contains useful reference information to assist system designers in comparing and selecting the best waveguide and flange combination. long and reasonably straight runs are present. 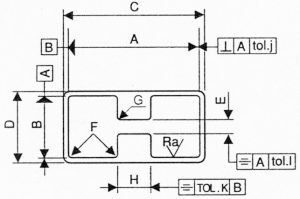 To benefit from the lower loss of MEC FLATGUIDE® without exciting the higher order, TE20 mode, the number of bends and twists must be minimized and their sharpness reduced by using a large bend radius typically 2 to 5 times the broadwall or “a” dimension. 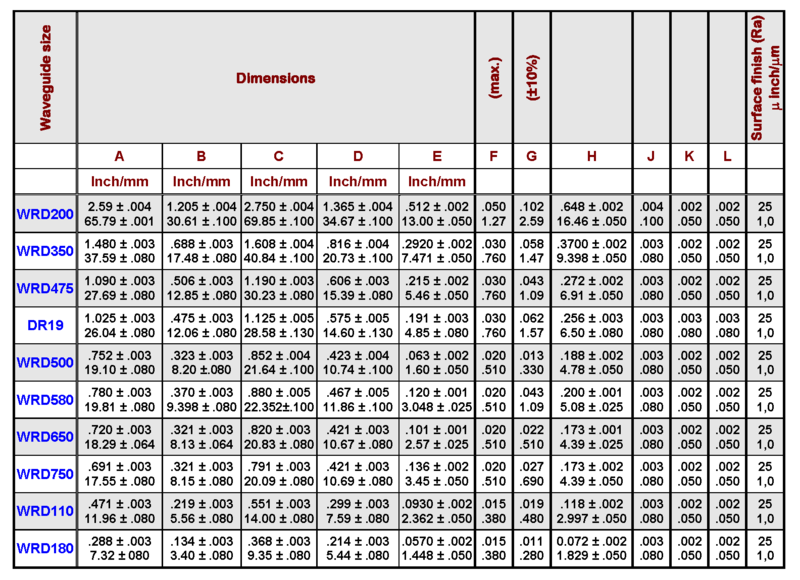 The “Characteristics of Double-Ridge Waveguide & MEC FLATGUIDE®” section above provides quantitative data for comparing the characteristics of double-ridge waveguide and MEC FLATGUIDE®. 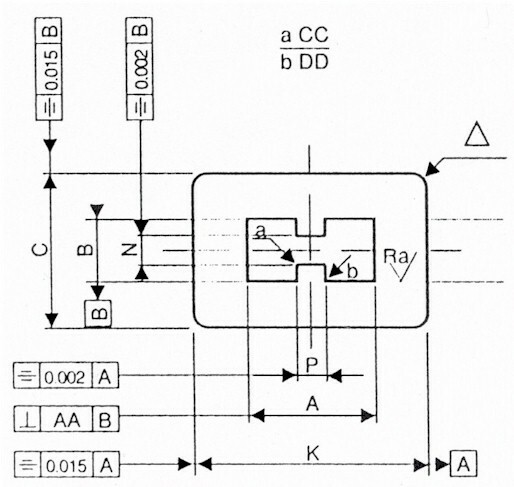 Our engineering department would be happy to analyze your specific application and recommend the best waveguide, whether existing or custom-designed. 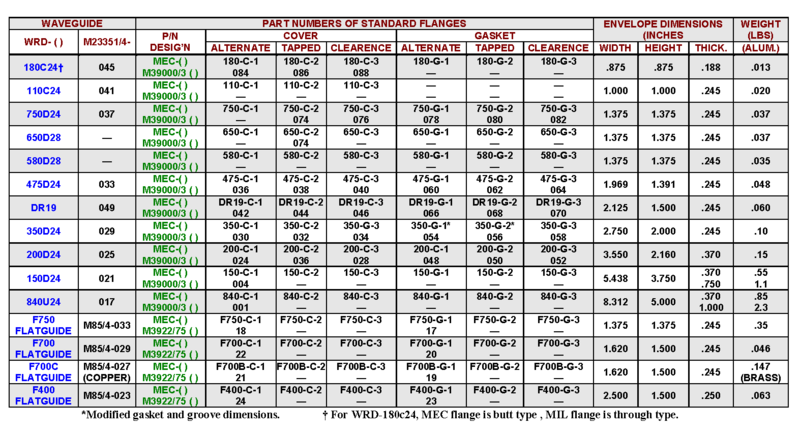 M.E.C.’s latest additions to the waveguide family are the WRD500 and WRD250 sizes. These typically cover a broad frequency bandwidth, 3.6:1 and 4:1, respectively, with low VSWR and attenuation. 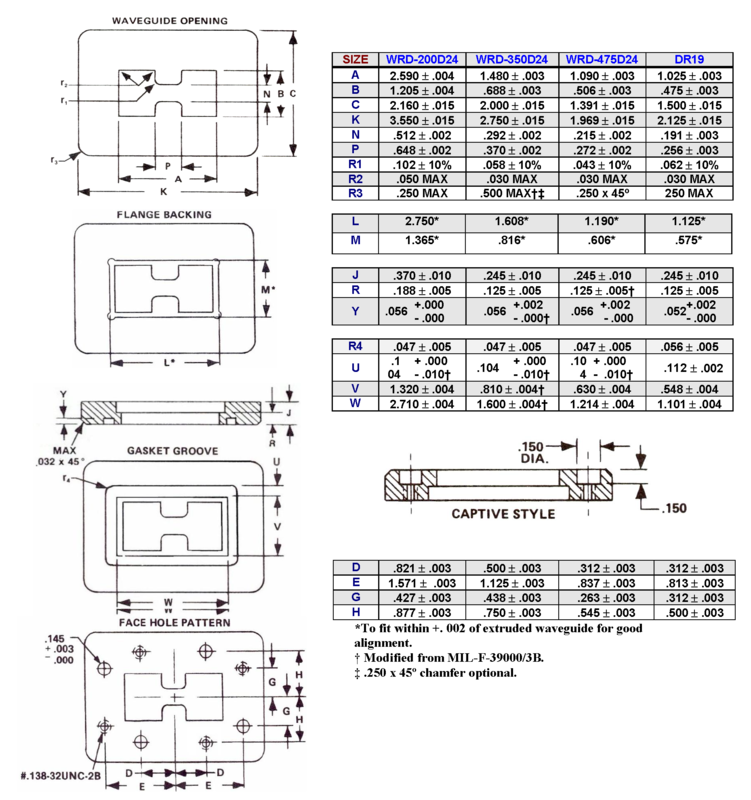 These waveguide sizes are used in our broadband, high power components and can be used on any other waveguide assembly or component. 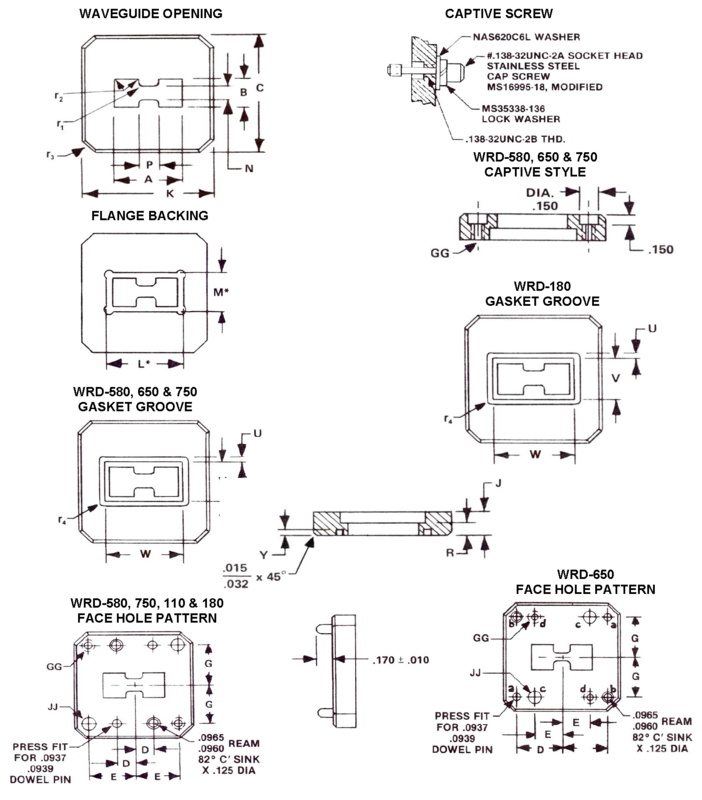 The flanges are available in aluminum or brass in cover or gasket grooved options. They are made to order and are available with short lead time. These products may be customized to suit individual requirements. 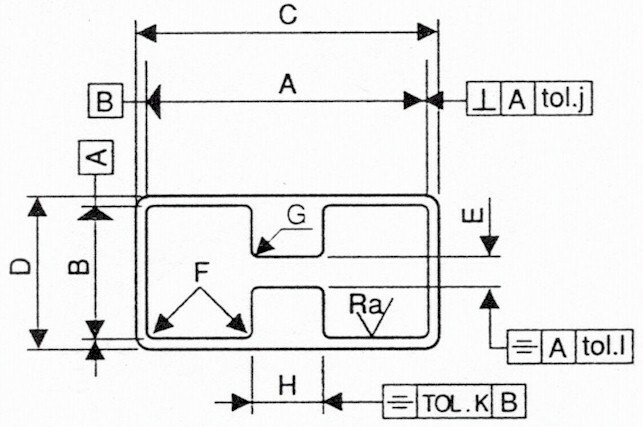 (1) Add suffix “-C” for Cover or “-G” for Gasket. 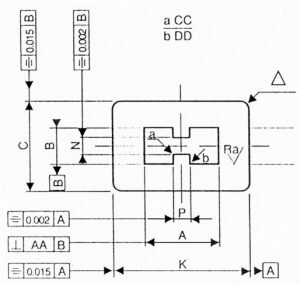 (2) Add “-1” for Alt. 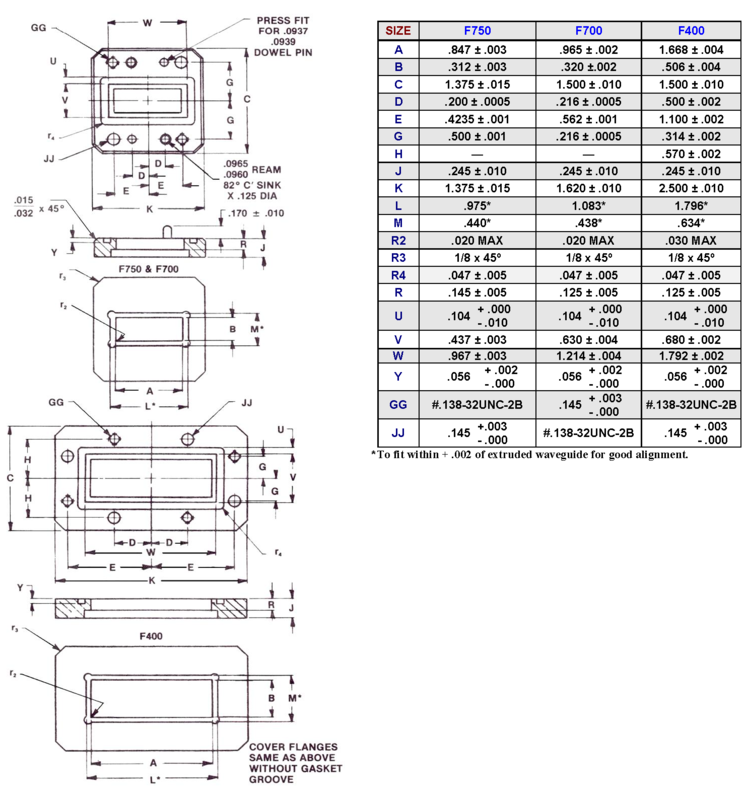 Tap and Clear, “-2” for All Tapped, “-3” for All Clearance, “-4” for All Captive Hardware, and “-5” for all helicoils. 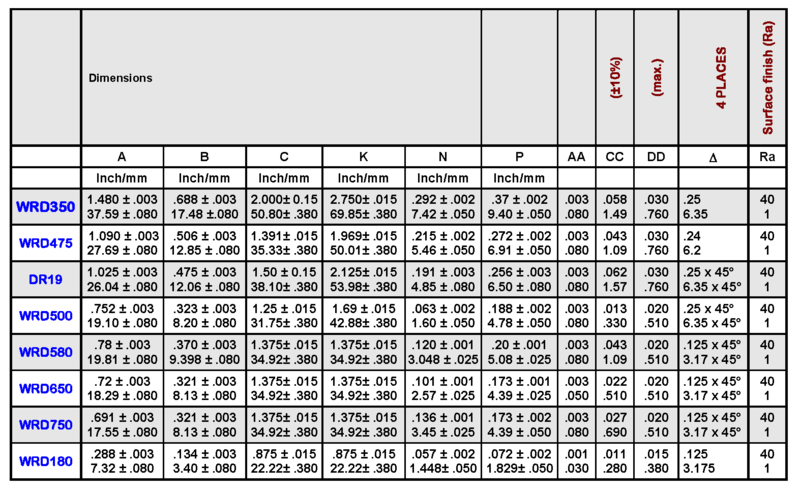 (2) Also, refer to the General Reference Information tables above.